There is a lot of information about the DiDi 38 Black Cat on which Passion X was based on designer Dudley Dix’s web site HERE. Passion X normally races under arbitrary handicapping but it currently holds an ORC Club (Offshore Racing Congress Club level) certificate pending accurate weighing after which it will have an ORCi (ORC International) certificate. The ORC rating and the the velocity predictions for the various wind speeds and angles provide a guide (and a challenge) as to how fast the yacht should be sailing. Passion X’s ORC Club certificate is HERE. The ORC ratings of a number of similar yachts are HERE. Here is a review of the Jeanneau Sun Odyssey 37 by Vanessa Dudley written in October 2000 when the boat was first released in Australia. It’s not every day that the opportunity comes along to take a new yacht for its very first sail. In the case of this outing on the Jeanneau Sun Odyssey 37, however, it quickly became apparent that the sails had not previously been raised. European Marine director Mark Elkington, and Victorian representative Steve Bond were busily fitting battens into sail pockets, connecting sheets to sails and taking plastic wrap off fittings when I arrived at the boat at Melbourne’s Pier 35. Having bumbled my way through the initial launchings of various smaller sailboats over the years, I found it impossible not to be impressed by the orderliness and organisation of the Sun Odyssey’s set-up, direct from the manufacturer in France. Like the other major international players in the recreational sailboat market, Jeanneau really has got its supply game down to a fine art. Assembling the boat looks easier than piecing together a child’s meccano set, and when in doubt you can consult the comprehensive owner’s manual. Australian representative European Marine has high hopes for the success of the Sun Odyssey 37 in the local market, believing that it supplies a level of comfort, interior space and modern cruising performance unmatched in its size range. The yacht has already received accolades overseas, including two awards at the Atlantic City Sail Expo 2000 in the US: Cruising World magazine’s Boat of the Year in the Best Value category, and selection in Sail magazine’s lineup of the top 10 boats of the year. The first Sun Odyssey 37 to reach Australia was rushed to the Melbourne Boat Show in July and was then available for this review before heading on by truck to Adelaide the following day, for the next boat show on the circuit. By necessity our first outing was therefore quite hurried, and what I would call a preliminary view rather than a thorough test. Hopefully there will be another opportunity in the near future; meanwhile first impressions were very positive. The Sun Odyssey 37 was designed by Jacques Fauroux as a moderately-rigged cruiser/club racer (a higher performance version is available as the Sun Fast 37) with two alternative interior layouts. The two-cabin version, as per the test yacht, is well-suited to private ownership by, say, a couple who like to share their cruising with another couple of friends from time to time, and/or take the kids. This layout provides two large double cabins – one aft to starboard and the other forward – and a saloon with L-shaped galley to starboard, while to port is a very large bathroom for this size of yacht, plus the compact navigation station and a large hanging locker. The alternative three-cabin version, with two symmetrical aft cabins, is more suited to charter applications or sailing with larger groups of people. The extra port-side cabin is added at the expense of bathroom space and elimination of the hanging locker from the saloon. Jeanneau prides itself on using traditional methods of hand-laid hull lamination, where the bulkheads (structurally reinforced) and the wooden structural grid design (stringers, cross-frames) are bonded directly around their full perimeter. Construction is to the European ISO 9002 certification in fibreglass boatbuilding. The company says that building with wood is a tradition among its workers, with in-house drying out of the logs and solid-wood furnishings as well as the veneer trim pieces (all Burmese teak) finished by hand. Modern technology prevails, though, with each piece of timber cut and milled by a “computer-controlled carpenter”. The rig comprises anodised aluminium Z Spar mast and boom with double swept-back spreaders and stainless steel wire rigging (upper, intermediate, and aft lower shrouds plus backstay on a bridle). The mast is deck-stepped, supported below by a stainless steel compression post. 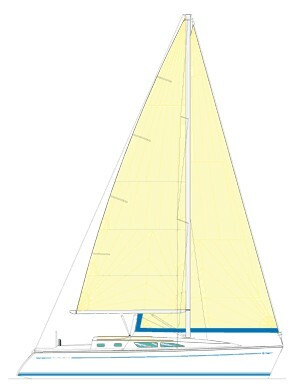 The standard rig includes an above-deck genoa furler and two sets of reef lines for the mainsail. There are two winches for halyards, sheets, and control lines plus two cockpit sheet winches. The mainsail traveller is mounted on the coachhouse, leaving the cockpit uncluttered. 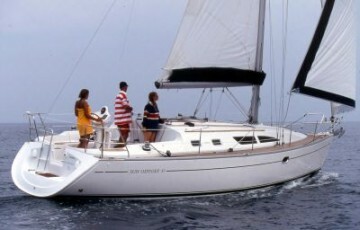 The cockpit is fitted with battened teak helm seats, cockpit seats, transom step, large storage lockers to port and starboard and gas bottle storage. The 90cm stainless steel steering wheel is set up on a large pedestal with instrument console and compass mount, plus a folding cockpit table. Walk-through access to the transom is provided by the removable helm seat, and there is a folding swim ladder and freshwater transom shower. 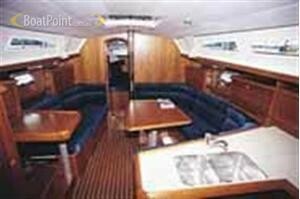 The saloon includes a teak table with fiddles and bench seating to port and starboard, plenty of storage compartments under the seats, and a good supply of natural light via the cabin windows with curtains and opening deck hatch with blind. There are removable teak floorboards, halogen lighting, and full headroom (1.85m to 1.91m throughout). For a 360 degree internal view click here. The nav station faces forward and comprises a chart table with storage under the hinged tabletop, electronic instrument panel, bookshelf, curved navigator seat with storage, main electrical panel (12 switches with thermal circuit-breakers), and access to the central water system located under the chart table. The L-shaped galley has a laminated countertop, stainless steel double sink with hot and cold water supply via a pressure mixer tap, two-burner Eno stove/oven with crash bar, and a 150lt capacity top-opening icebox with a 12V Frigomatic refrigeration system. The aft cabin has a big double berth (2.04m x 2.10m), opening cockpit and roof ports, hanging locker with shelves, and lateral shelving along the hull. Access to the engine compartment is through removable panels on the inside wall of this cabin, while the battery compartment and fueltank are underneath the berth. The forward cabin has a big double berth (2.05m x 1.60m), storage compartment and water tank underneath, a large hanging locker with shelves and lateral shelving along the hull, and an opening deck hatch with ventilator and blind. There are good positive locks on all doors, cupboards, etc, throughout the interior. The bathroom is an integral moulded fibreglass unit, well set-up with hot and cold pressurised water to the washbasin and separate shower area, which has its own folding seat and door. Access to the thru-hull fittings is via the storage cupboard under the sink. There is also a storage locker over the washbasin and toilet (a Jabsco manual unit). An electric shower sump pump is supplied and there is a roomy wet locker in the shower compartment. The engine compartment is insulated and soundproof, with access to the 40hp Volvo diesel through the hinged companionway and the side panels. The standard propeller shaft is stainless steel, driving a fixed two-blade propeller. A 28hp Yanmar engine is an optional substitute. Our sail was in light to moderate winds and flat water around the Docklands area of the Yarra River. The Sun Odyssey is rigged for comfort, leaving the speed card to its sister, the Sun Fast, and my initial impressions were that the mast was relatively small. But once the sails were set for the first time, the rig looked nicely proportioned and the boat accelerated cleanly in the gusts, displaying no obvious vices or sluggishness. As a brand-new boat, it was yet to be loaded down with the piles of gear and personal effects which dampen the performance of cruising boats around every waterway of the world. But in any event the indications are that this should be a decent, moderate performer, neither on the edge of control nor snail-paced. Under motor, the Sun Odyssey 37 had ample power and manoeuvrability, turning through 360o on only slightly more than its own length. While sailing performance was not disappointing, the standout feature was that interior layout, providing a very roomy, practical and comfortable living space for a 37-footer. This, combined with the modern looks and competitive pricing, add up to an attractive package. The folks at European Marine could well be right in believing they have a winner on their hands. Two-cabin layout allows that welcome slice of extra space to be added to most sections of the interior. Cockpit and side-decks are uncluttered and easy to move around. Buyers who get bitten by the racing bug may feel stymied by the limited options for powering up the rig, but let’s not forget this is the cruising version. Leather wheel cover, deluxe bathroom, steering console, mooring kit, drop-down table, shore power socket in cockpit, extra 70AHr battery, velvet furnishing material in interior, two opening portholes in saloon. 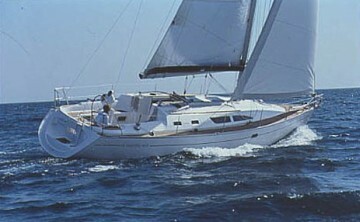 To view the Sun Odyssey 37 Owner’s Manual (in French and Frenglish) click here.